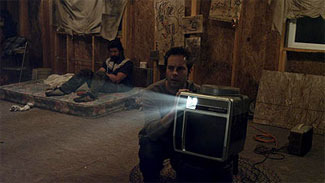 Michael (Peter Cilella) receives a video of his friend Chris (Vinny Curran), who appears tweaked out and shooting a gun at imaginary birds. Michael finds Chris in a rundown cabin and handcuffs him to a pipe, intent on breaking his friend’s meth habit. Soon enough the duo are finding strange messages in the cabin, are visited by local toughs, find out the cabin sits on a reservation, and there is also a weirdo cult next door. To make matters worse, Chris never set Michael the initial video and has no idea who did. It’s impossible to discuss Resolution without revealing its central premise. I really recommend you go into it without any foreknowledge; it’s a great film with an interesting angle on horror tropes. So, spoilers from here on out. Resolution begins straightforward enough, and it’s a credit to the performers that even these early moments are both funny, touching and aggravating. The outré horror elements begin to creep in slowly and steadily. Any seasoned horror movie viewer begins to try and anticipate what’s coming. Some do it out of a misplaced need to ‘outsmart’ the film, others just out of familiarity with the tropes and traditions of horror movies. Resolution pulls its first trick here by tossing disparate and seemingly unrelated horror clichés at the viewer; strange videos and photos, a mysterious cult, a house built on Native American land, etc. While Michael struggles to understand everything, Chris repeatedly fails to engage with the encroaching weirdness thanks to his withdraw symptoms, it frustrates the viewer but does so in just the right way to keep them off balance. Resolution gets a lot of comparison to Cabin in the Woods (2012). Both films take traditional horror film elements and cast them in new contexts, but I think Resolution does it one better. Not only are horror story elements recast, but the entire idea of narrative and closure (or as is often the case in horror films, anti-closure), is given a deliberate malice towards its characters. The monster they struggle against is the story itself. It attempts to drive them towards bad end after bad end and only by refusing to play along can they survive. But all films and stories have to end eventually, and Resolution does so in way that satisfies both within the context of the story and upon meta-textural structure that it’s built. Hey, remember that time you weren't a crackhead? That was great. The movie manages to be genuinely funny, mostly through Chris’ drugged out fatalism. It presents its postmodern story in way that is clever without ever being smart-alecky about it, something I think Cabin in the Woods fails at on occasion. There’s a real heart at its core, and it doesn’t forget to be a story about two friends with a strained relationship. 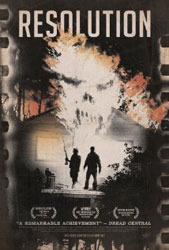 Resolution is not an expensive looking film; it keeps the majority of its events in a single room, and only occasionally strays out into the woods or a nearby town. The visuals aren’t remarkable, save for a few moments of genuine chills from some of the mysterious films and videos. Resolution is definitely worth taking a look at; I’m always pleased to find a horror film that treats its audience intelligently. Highly recommended.